The ES-4 is discontinued. Please see the ES-40 as an alternative. 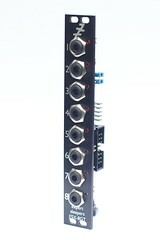 The ES-4 is a Eurorack format module which converts a standard S/PDIF input to five channels of control voltage. Two of the five channels are calibrated to provide over 5 octaves of 1V/octave pitch CV. The remaining three channels are general purpose outputs (for use as e.g. gates, envelopes, LFOs) and each have a nominal range of 0-10V or ±5V (user selectable). Since S/PDIF is a stereo-only format, the encoding of the five channels on to two is handled by software provided as part of Expert Sleepers Silent Way. The ES-4 will connect to any audio device using the S/PDIF standard. This includes the digital audio output provided as standard on many recent Macs (more info here on the Mac connection). The ES-4 also includes an S/PDIF output for sending data back to the computer. This output is used by expansion modules connected to the ES-4; currenty, the only such module is the ES-7 CV Input Expander. Expert Sleepers ES-4 Demo on Vimeo. Unlike the ES-3, the ES-4 requires particular software in order to generate meaningful output signals. Currently, the only such software is the 'ES-4 Controller' plug-in, part of Expert Sleepers Silent Way, and our Max/MSP external (see below). Silent Way is available in AudioUnit, VST & AAX formats for Mac OS X and Windows. Use of Silent Way therefore requires a compatible host application (DAW). For users of older Pro Tools versions, the legacy Silent Way v1.7 is known to work with the FXpansion VST-RTAS wrapper. A Silent Way licence is not included with the ES-4 - however, the ES-4 Controller plug-in functions in a licence-free mode, so ES-4 users are not forced to buy Silent Way. Such users can than evaluate the rest of the Silent Way suite in demo mode. We provide an 'external' for Max/MSP to enable users of Max to easily integrate the ES-4 into their patchers. This can be downloaded from the downloads page. Expert Sleepers es4encoder~ Max/MSP external on Vimeo. 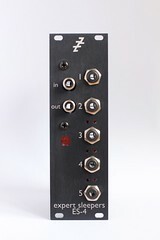 The ES-4 Gate Expander is a Eurorack module which works in tandem with the ES-4 to offer 8 on/off outputs for use as gates, triggers, clocks etc. 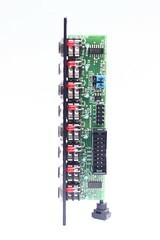 Up to five ES-4 Gate Expanders can be attached to one ES-4 - one per ES-4 channel. (The 8 outputs of the Gate Expander reflect the 8 bits of CV information passed to the ES-4's DACs.) Therefore you can combine the modules to create a system with up to 40 independent gate outputs - all driven from a single S/PDIF connection. The ES-4 Controller software (part of Expert Sleepers Silent Way) also allows the Gate Expander outputs to be used for DIN sync or MIDI output* (note - not just MIDI clock output, but as an actual MIDI port, capable of sending any MIDI messages). Since these outputs are driven from an audio connection (the S/PDIF port), they have sample-accurate timing, which no USB MIDI interface can claim. 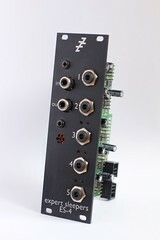 The ES-4 and ES-4 Gate Expander are available now. DIN sync from the ES-4 on Vimeo. ES-4 vs USB MIDI on Vimeo. Read ES-4 news articles on the Expert Sleepers blog.